A Bath Gift Card is the perfect flexible present for any occasion, from birthday and Christmas presents, to weekends away and holiday surprises. It is accepted across the city in over 200 shops and restaurants, hotels and bars, museums and galleries and health and beauty outlets. The Bath Gift Card is a MasterCard based gift card which can be used at participating businesses in. Just choose the amount you want to pre-load onto the card, and give the card to friends, family or colleagues for them to enjoy in the city. If you wish the card to be posted to you or someone else, please choose the postage option at checkout, otherwise cards can be collected from the Visitor Information Centre on arrival in Bath. Our office is situated at Bridgwater House, 2 Terrace Walk, Bath BA1 1LN, and we are open Monday to Saturday 9.30a.m.-5.30p.m. We are closed on Sundays during the winter (with the exception of Sundays 25th November and 2nd December), so customers will not be able to collect cards on that day. 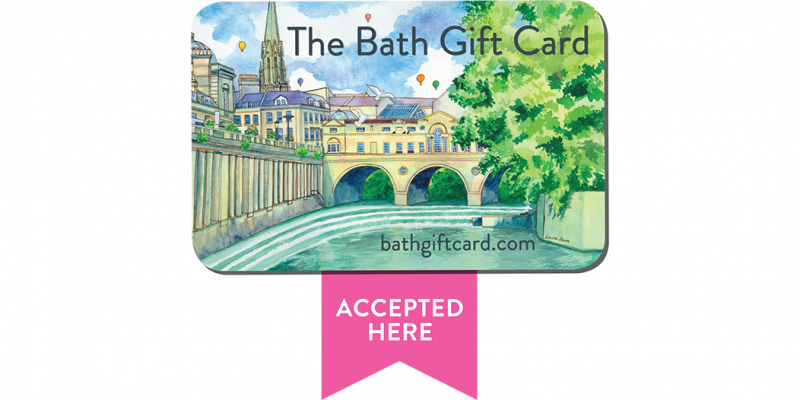 For full terms & conditions and for a full list of participating businesses go to www.bathgiftcard.com. Please note: cards expire 12 months from date of purchase.